This fantastic and well established event is part of the Zero Degrees Festival which runs for over two weeks. This Louth based festival includes a huge range of events and performances including music, theatre, art and comedy. You can find out more about the events this year on their Facebook page. More details about this year’s Vintage Day can be found on the Facebook Event. This year we are so excited to be welcoming Big Boy Bloater to Louth. An imaginative songwriter, an engaging entertainer, a world-class guitarist and vocalist: A show with Big Boy Bloater is a unique and fun experience. Bloater has been a favourite of ours since the earliest days of our clubs back in London and it will be awesome to have him playing for us again. In addition, we are delighted to be welcoming The Dave Pearce Orchestra - a big band playing the music of Glenn Miller. This is sure to be a hit with dancers and listeners alike! Come and join us for one of our favourite events of the year. 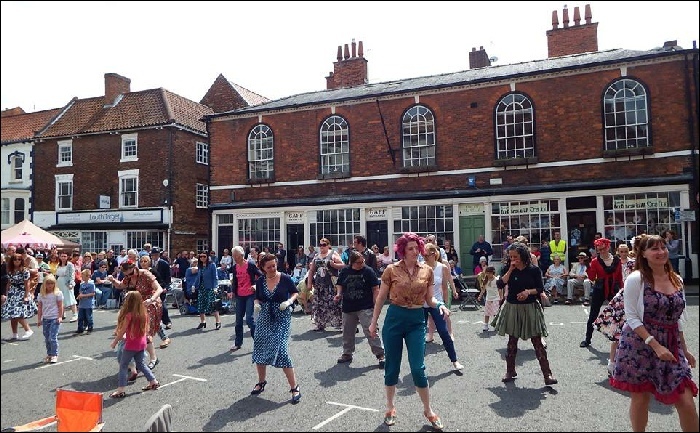 Dance in the street, enjoy the vintage market or sample food and drink from the surrounding cafes.